The LED bright white strip lighting I used. 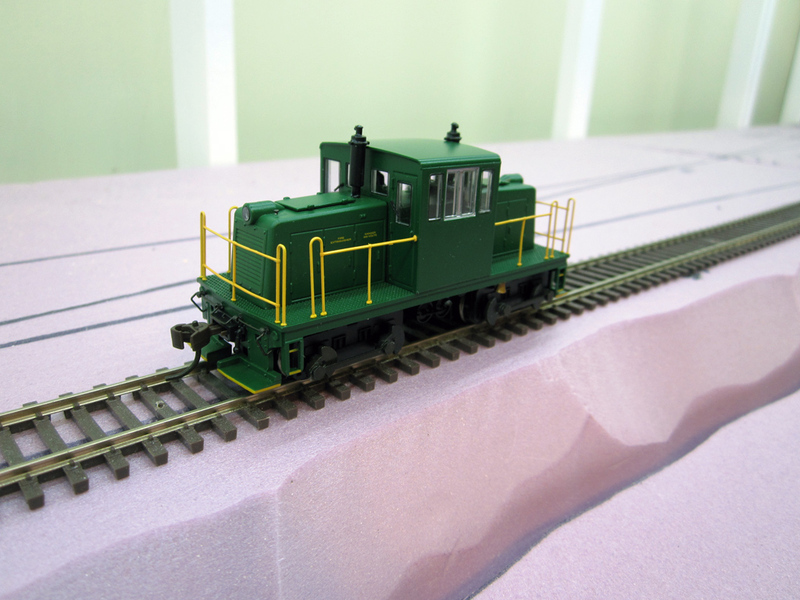 I purchased the components I needed from Micro Mark and Amazon, though I think that with a little searching it would be possible to get everything from Amazon for cheaper. 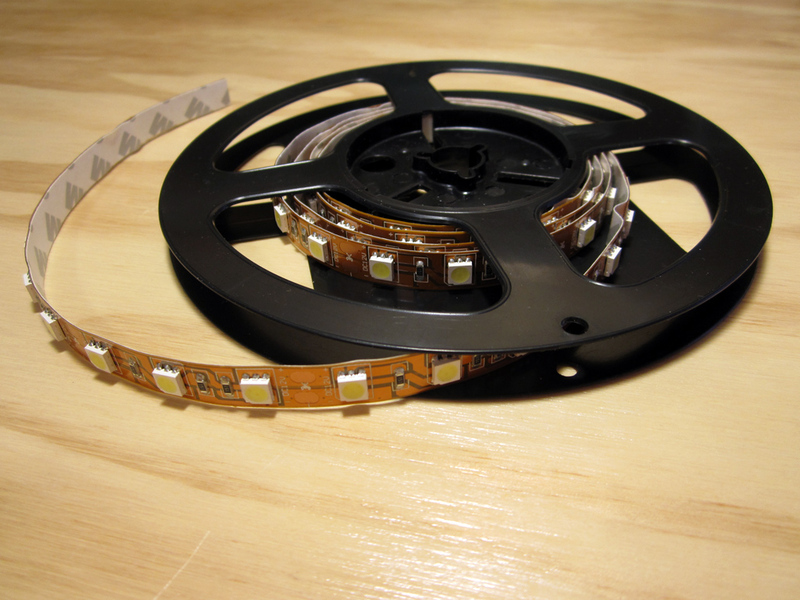 The LED’s came on two 5 meter long reels and are 10mm wide (at Amazon you can find them in different widths). They are self adhesive and have marks for cutting every 3 LED’s. There are many colors and temperatures available. I went with the 5000k Bright Whites because after a little research that seemed to be the best temperature for simulating daylight. I was a little concerned that this might be too “cold” of a color resulting in a blue tinge, but that turned out not to be the case. Even with the room lights off, the layout has the feel of a warm summer day. The lighting power supply with its cover off. 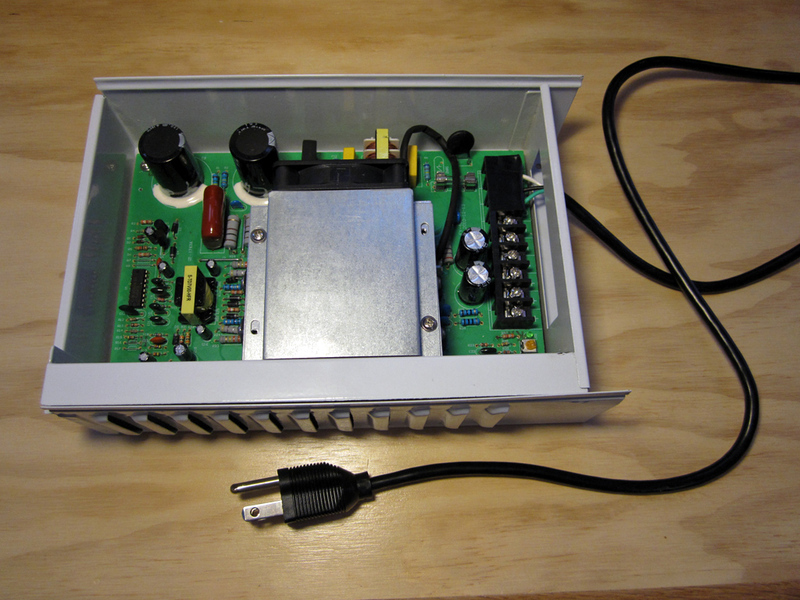 Since I wasn’t entirely sure what I was doing when I started this process, I went ahead and purchased the 12 VDC, 33 Amp Power Supply Unit that Micro Mark sells. It’s a little chintzy, with a removable cover and no protection over the 120v input terminals (I followed the instructions and sealed them off with a few pieces of electrical tape). I think Micro Mark now sells a newer one with a cover that screws on and a fold-down lid over the terminals. If I were to do this again, however, I would try to adapt a standard desktop computer PSU. It shouldn’t be too difficult to use the 12v rails to power the LED’s and it would be a lot cheaper (free if you can scavenge an old computer). The… sketchy… electrical connectors on the power supply. 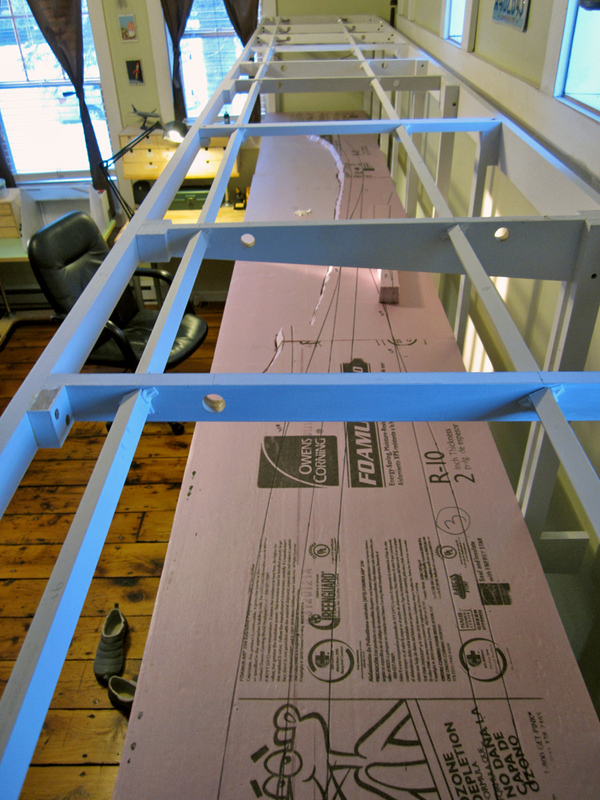 The PSU is mounted to the underside of my desk, which is integrated into the support structure for the legs. This puts it out of the way visually as well as audibly since it has a pretty noisy cooling fan. It isn’t switched so I have it plugged into a power strip that’s easily accessible. At some point in the future I hope to add a programmable dimmer. The barrel connector that attaches to the end of the lighting strip. 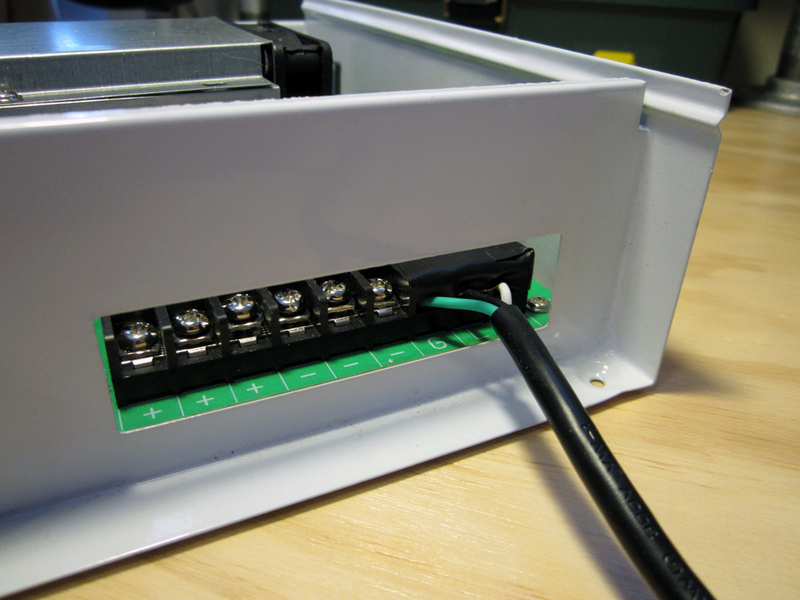 Connecting the PSU to the lighting strips is pretty straightforward. The strips have a female barrel connecter on one end and Micro Mark sells the male connector in packages of 5. Very simple and elegant. Plus it makes disconnected the PSU even easier. 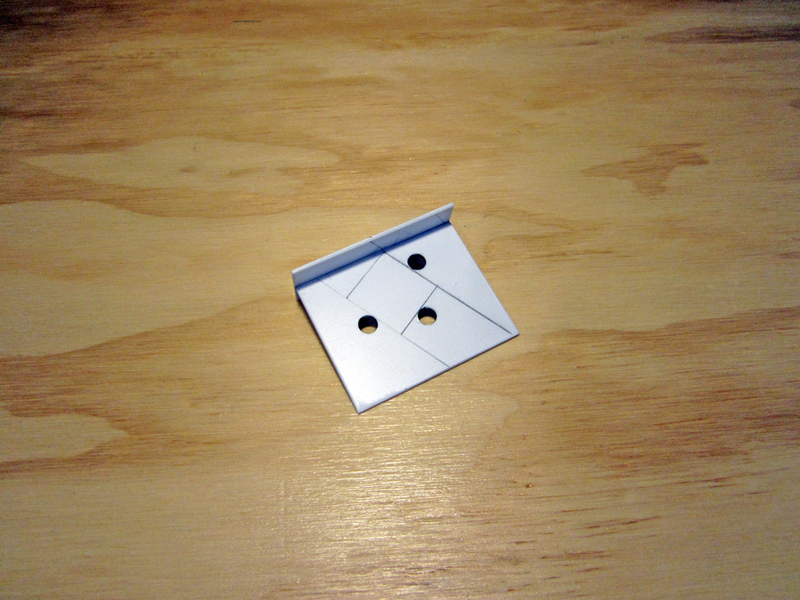 The template i made to accurately position and tilt the 3/4 trim stock I mounted the LED’s on. The light strips are mounted on sections of 3/4″ x 3/4″ wood molding that I painted white and cut to fit between the canopy supports. 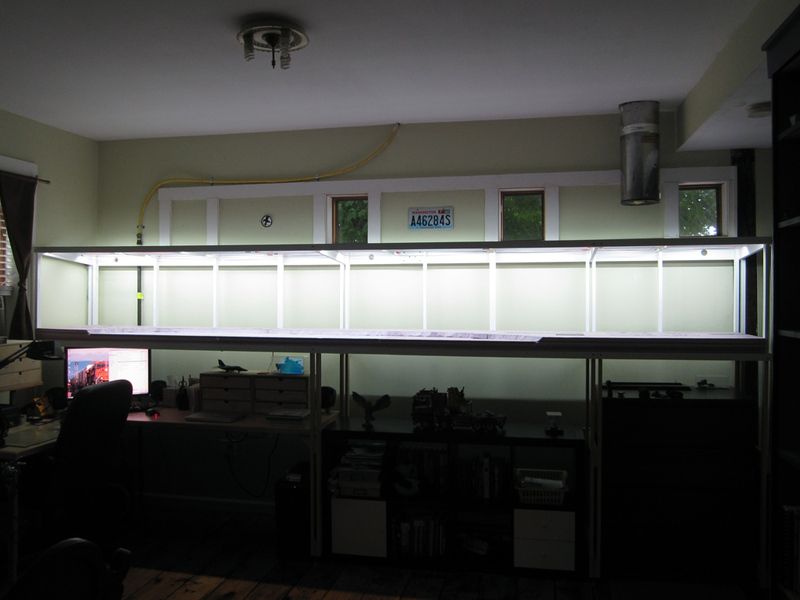 Each light bar is held in place by three plastic shelving pins. After some testing I determined that the LED’s were most effective when mounted slightly angled towards the backdrop, so I created a styrene template to assist in drilling the holes for the pins so that each bar would be positioned the same. 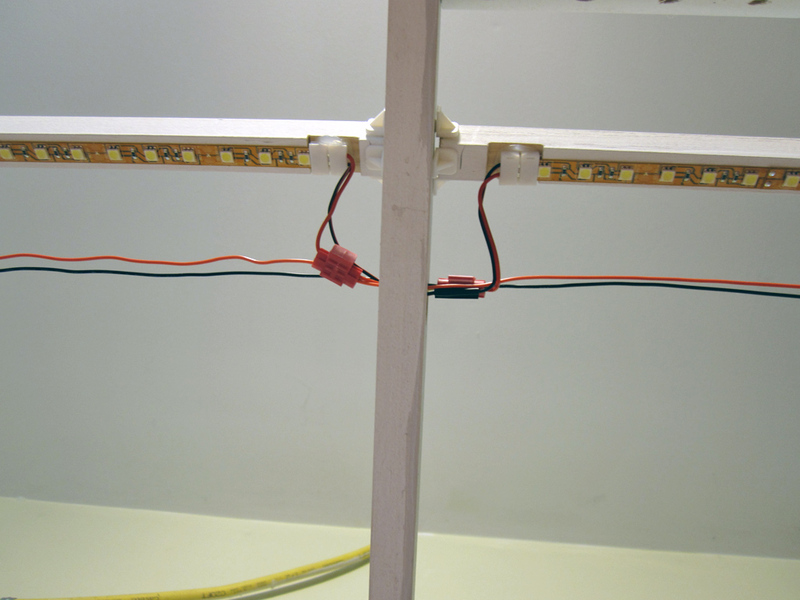 Plastic shelf pins are used to hold the light bars in place at the appropriate angle. 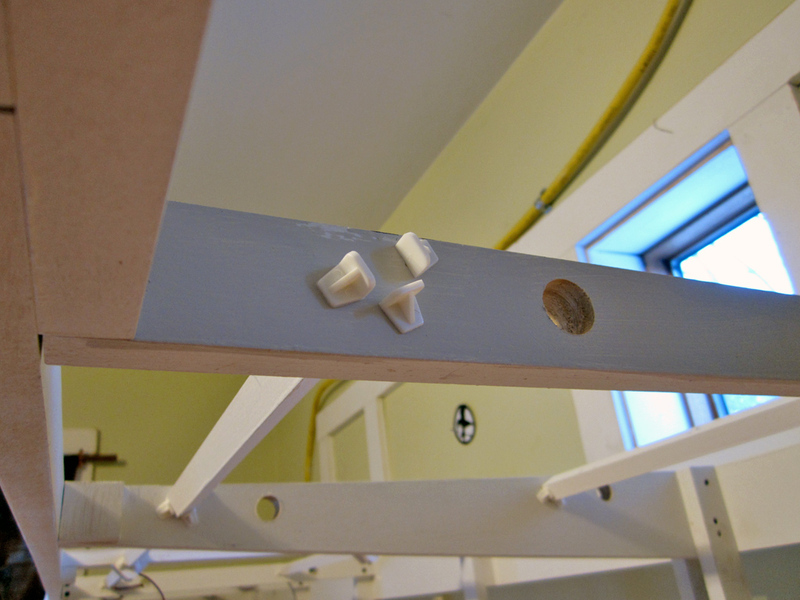 In order to secure the wiring and keep it from hanging down into the layout, as well as to provide a way for the bus line to pass through the valance supports, I drilled a 3/4″ hole next to each set of shelf pins. All the light bars in place. 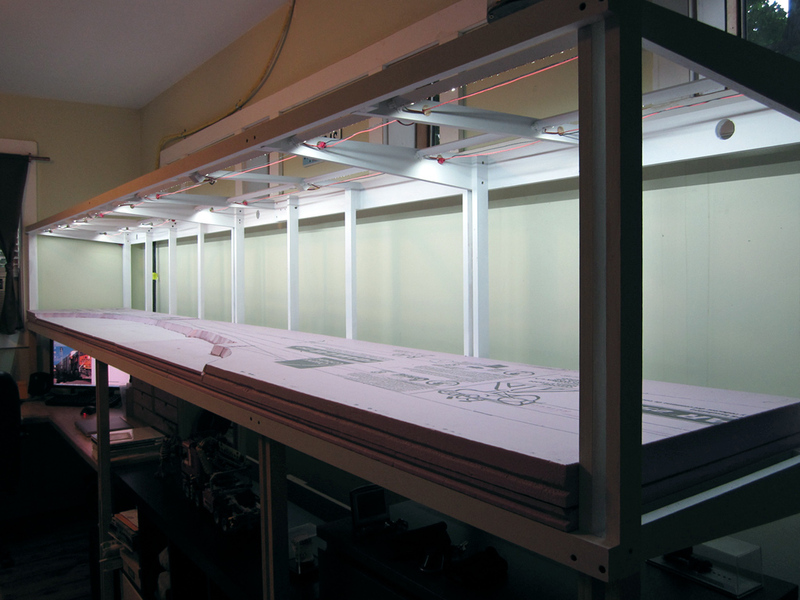 The two banks of lighting run parallel to each other for the entire length of the modeled portion of the layout. The first bank is set just a few inches from the front and the second sits about a foot back from there. This allows the entire layout and the backdrop to receive even lighting throughout. LED’s and bus wire have been run and spliced together. Once I had the light bars in place, I cut the LED strips into the appropriate lengths and stuck them to the bars. In order for them to lay flush with the wood at either end I chiseled small notches for the connectors, which are kind of bulky. Each connector clips on to the end of a strip, and has leads that run to another connector that attaches to the next strip. Every other lead is spliced into an uninterrupted pair of bus wires that run the entire length of the layout. Each bank of light has it’s own bus. 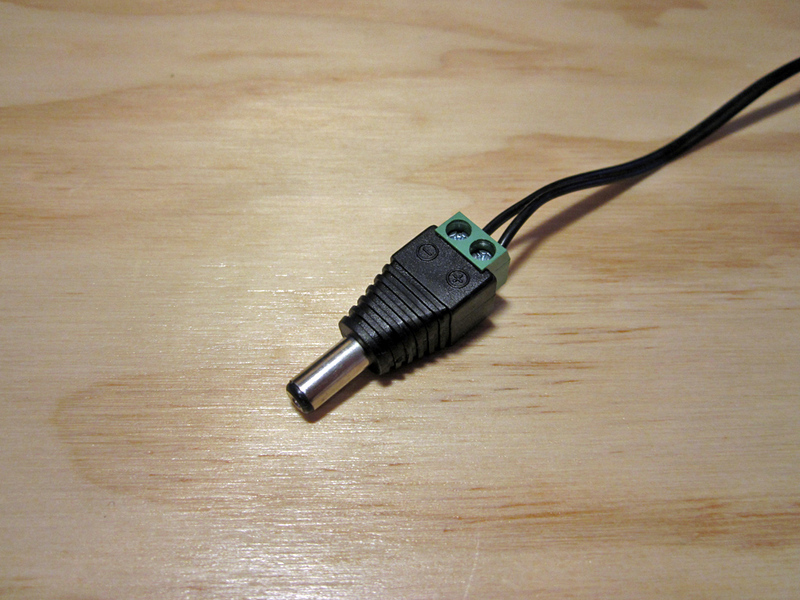 The special connector I made for the end of the strip lighting. 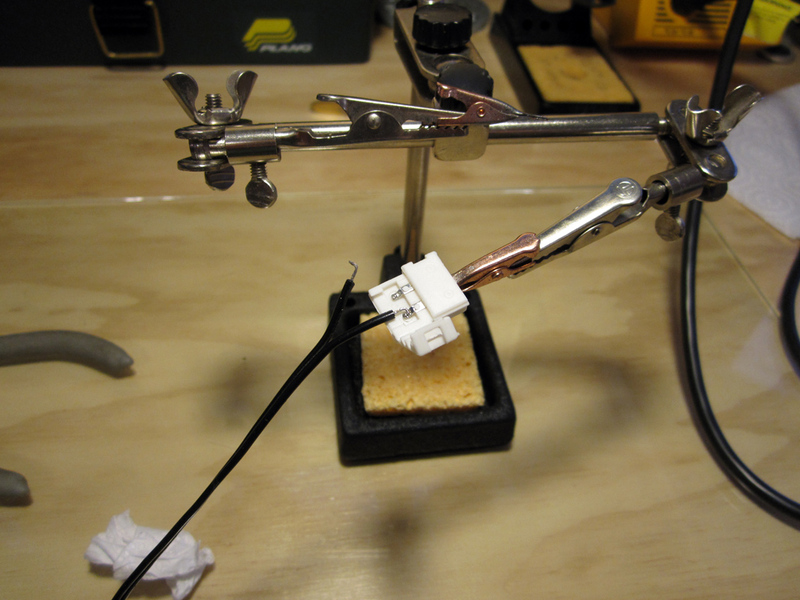 At the end of the last strip, I modified a strip-to-strip connector by soldering it to the ends of the bus wires. Incidentally, the bus was not originally part of the plan. It was only once I was halfway done that I realized that the electrical connections were not tight enough to provide clean power to the entire run of the layout. The farther a light bar was from the PSU, the dimmer it would be. I also noticed a good deal of flickering. Fortunately, the bus solved these problems with just a minimal amount of fuss. Both banks of LED’s in place and wired. 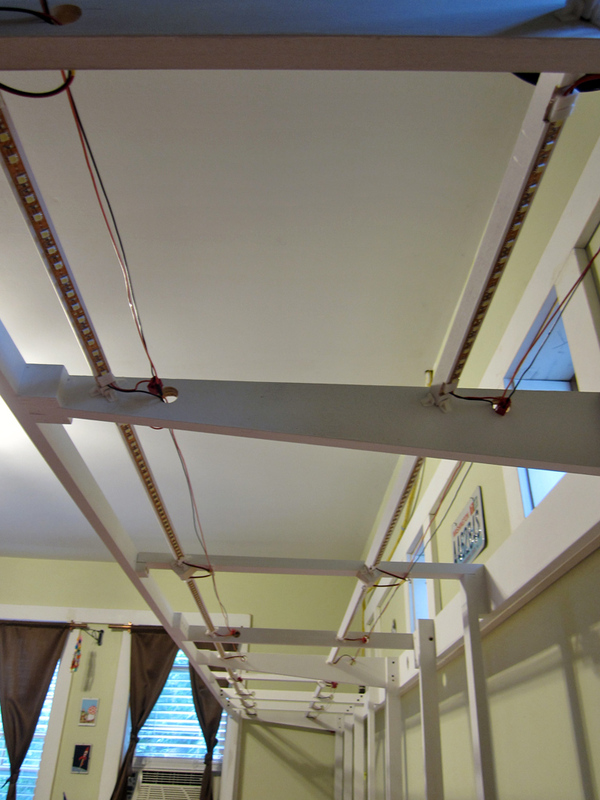 Overall, this lighting system is fairly straightforward and has a low profile. Everything is tucked within an inch of the layout canopy. It would be nice to have a diffuser panel that hid the LED strips and the wiring and helped to evenly distribute the light, but I didn’t incorporate that into the design due to uncertainty about whether or not LED’s would work and concern for the height of the layout. I may try to add diffuser panels in the future, but likely I won’t bother, for the most part visitor’s won’t notice the wiring and the sheer number of LED’s means that the light is already fairly even. A test to see how models look under the new LED lighting. After installation was complete, I set some models on the layout to test the overall temperature and coverage. I like how it looks. I may add spotlights for photography, but for viewing the layout in person, this system works well. It should be even better once the white canopy panels are in place as they will reflect more of the light downwards. The layout with the rest of the room lights off. It’s very bright and mimic’s daylight well. The next project is to put in the backdrop, which will likely be cut from 4’x 8′ sheets of styrene and get started on the staging yard. Then I’ll be able to finish up the canopy and valance and begin on actual module construction.